This past Saturday, I had the opportunity to visit a brewery for the first time and also to attend an event for the first time! For the past five years, Left Coast Brewing Company has hosted the San Clemente Micro-Brew Festival. This event supports a fantastic cause, Welcome Home Military Events which are put on by the San Clemente Chamber of Commerce. The event was held in the parking lot of Left Cost Brewing Company and had a great variety of beers to sample. There were two tickets available for festival attendees, VIP allowed guests to enter the festival one hour early, which is a great idea. Being able to enter the event an hour early made it easy to sample both new beers as well as old favorites. Admission to the Micro-Brew Festival included 12 four ounce pours, which was more than enough. The festival was five hours for VIP ticket holders and four hours for general admission ticket holders. This was an ample amount of time to sample beers as well as to have time to chat with friends. I like events where I don't feel rushed to try super popular beers which may result in a huge line. The San Clemente Micro-Brew Festival was very well organized, the check in process was very smooth and I loved how they included a list of the breweries along with their beers they would be pouring as you entered. Although the weather was overcast, and actually started to rain a short while after general admission ticket holders were admitted, I'd rather have a cloudy day for a beer fest than a super hot day! I had a fantastic time at the San Clemente Micro-Brew Festival. I loved that there were breweries that I had sampled before as well as ones that I hadn't tried yet. Everyone was very happy and eager to talk about their beers. I also enjoyed that the crowd was super mellow. Adults are always telling kids to stay away from strangers. Interacting with them can of course, be dangerous. But, as adults, in the social media age, it is not only encouraged but widely accepted to interact with and even befriend strangers. While I love attending baseball games with friends, it's not always feasible. With 162 games in MLB, it's nearly impossible to attend even all of the home games of my favorite teams. So what's a baseball fan to do? Watch games with fellow fans through social media. One of the easiest and fastest ways to interact with fellow fans is through one of my favorite social media channels, twitter. Instead of sitting at home alone, yelling at my t.v. and scaring my dog, I'm able to talk about games with fans from all over the world. Besides talking with fellow fans during games, it's a great way to express optimism about upcoming games as well as analyze games afterwards. Another advantage to using social media is being able to interact with players. I often wish that social media had been around when I was a kid just so I would've been able to tell Mr. Padre how much of an inspiration he was to me. I think one of my favorite parts about social media and baseball is that not only have I found another way to enjoy games, but, I've even made friends outside of the world wide web. Many of my friends that I've interacted with over the years are now close friends. These are people I may have seen at games in the past, but would've never approached to ask their opinions on about how our favorite team could improve. Using social media is such a great way to build camaraderie among fans. So, although it is usually frowned upon to talk to strangers, in the case of social media and baseball, I think it's a win win. Opening Day of MLB is one of my favorite days of the year. This past Friday, I was able to return to one of my most favorite places on Earth, besides Disneyland, Angel Stadium. Going to games at the Big A are one of my favorite things to do, besides visiting new breweries. For the past two years, I've written about the craft beer offerings at the stadium on my blog. It's been great to see a steady increase every year. 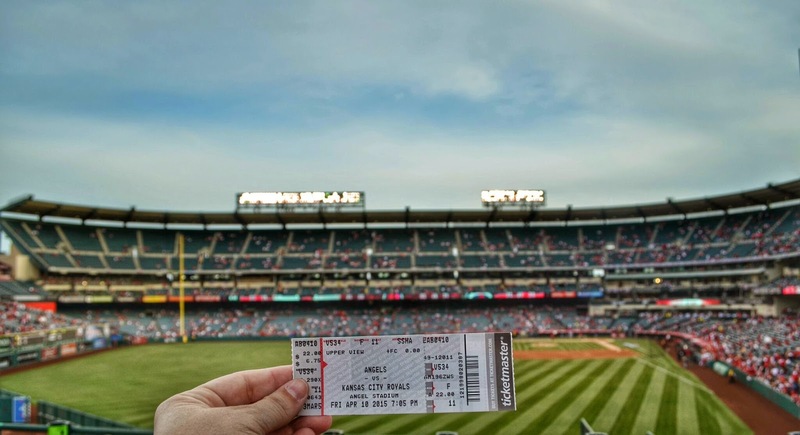 Attending the Angels home opener was a great opportunity to not only watch a game but also check out the latest craft beer options at the stadium. Before I go to any game at the stadium, I first have to visit one of my favorite local breweries, Noble Ale Works, which is located just north of Angel Stadium. Having a beer at Noble Ale Works before walking over to the game is a great way to support a local brewery before supporting my local baseball team. As in the past few years, the location with the widest variety of craft beer is also closest to the entrance to the stadium. Located near Gate 2, Draft Pick once again this season has a great selection of both local, regional, and national breweries. I was happy to see that along with breweries that have been present at the stadium the past few seasons, there were also newer breweries on tap as well. Two new craft beer options are the stand alone cart from Firestone Walker which is near section 204 and another large stand located near the Left Field Pavilion, not far from section 256. The new larger stand has most of the same beers available at the Draft Pick stand as well as a few macro selections and ciders. As with last season, Golden Road Brewing has stand alone carts such as the one located near section 233. This fella is happy to pour yummy craft beer! Another stand with craft beer! While Angel Stadium boasts the lowest cost per ounce of beer in the MLB this season, their price of craft beer increased by $0.25 this season. For $13, you are able to enjoy 24 ounces of craft beer, which equates to $0.54 per ounce versus $0.28 per ounce for macro styles of beer. Considering that breweries near the stadium charge an average of $0.31-$0.37 per ounce, while it is nearly double the price, it is still reasonable for a sports venue. It's exciting to see that each year over the past three years has seen an increase in not only the variety but also more locations throughout the stadium. Even though the price is more for craft beer, I'm happy to have the option to enjoy some of my favorite breweries while watching my Angels play games at the Big A. Besides enjoying delicious beer at the game, I of course also watched the game. 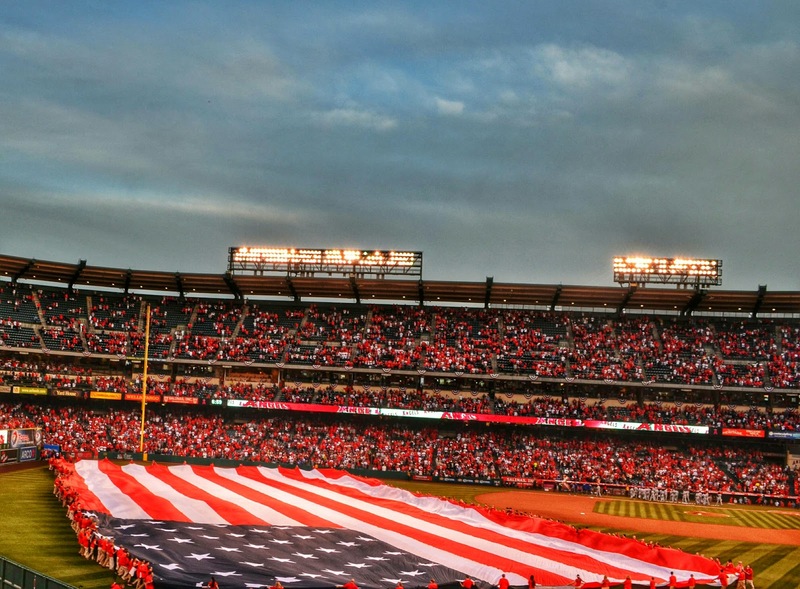 One of my favorite parts of Opening Day, besides the excitement of a new season is the flyover and gigantic U.S. flag that is walked out onto the field.